IQ is an acronym for “Installation Qualification”: which is defined by the FDA as, establishing by objective evidence that all key aspects of the process equipment and ancillary system installation adhere to the manufacturer’s approved specification and that the recommendations of the supplier of the equipment are suitably considered. The Installation Qualification (IQ) execution; verifies that the equipment, and its ancillary systems or sub-systems have been installed in accordance with installation drawings and or specifications. It further details a list of all the cGMP requirements that are applicable to this particular installation qualification. These requirements must all be satisfied before the IQ can be completed and the qualification process is allowed to progress to the execution of the (OQ). Conformance with continued Good Manufacturing Procedures. (cGMP's) requires, that what ever approach is used, it is fully documented in the individual Validation (Master) Plan (VMP or V P). The IQ should not start with the Factory Acceptance Testing (FAT) or Commissioning tasks, but it should start before these tasks are completed; enabling the validation team to witness and document the final FAT and commissioning testing. The integration of these activities greatly reduces the costly and time consuming replication of unnecessary retesting. There is a grey area of testing / inspection in the transition from the IQ to the Operational Qualification (OQ) that is open to rationalization, i.e. it has to be done, but it can satisfactorily be included in either the IQ or OQ. On most projects the simpler the IQ is kept, the quicker it is completed, reviewed and out of the way, allowing progress to the OQ. It can therefore pay dividends to keep the IQ as basic as possible. Where possible, the IQ can be kept to the pre-powering up stage. Keeping the IQ at this level allows healthy project progress. There should be no powering up or utility problems to hinder IQ sign off, and rapid progress through the OQ to the Performance Qualification (P1Q) and where applicable the Process Qualification (P2Q), becomes feasible. It can be reasoned that as soon as you power up, you enter the equipment operation stage, where verification of the User Requirements Specification (URS) and 21 CFR Part 11 verification testing are undertaken. For this reason we have built in flexibility to allow some the tests and inspections to be included either in the IQ and OQ, allowing maximum flexibility to the planning of IQ / OQ execution. This has not been done just because it might work, this has been advocated by us for some time. We have experience major delays to projects, caused purely by waiting for the client to complete document reviews and approvals. See Comment 9 in cGMP-FDA-483. The scope of the IQ testing/inspections will cover the under listed subjects, but is not restricted to them alone. Verification that all components parts ~. Verify installation is as specified ~. Insert a brief description of what part of the validated product process ~~..
Insert a brief description of the operational function ~~. .
Verify supply voltages conform with ~~. Verify that electrical installation qualification (IQ) complies with ~~. Verify that all alarms and visual displays are ~~. Verify that where used, the correct versions of ~~. Confirm that the issue level of software ~~. Identify and verify that serial numbers and model number of all ~~. Review all calibration certificates for ~~. Verify where used, there is signals continuity~~. Verify signal continuity between ~~. Verify that the ambient conditions are ~~. Verify that the documentation provided by the ~~ maintenance of the system ~~. The VMP must give an auditor an overall vision of how you: as a manufacturer, have integrated cGMP into all of your regulatory controlled activities. An organogram should indicate management structure and engineering drawings should indicate your facility and utility systems along with product flow and personnel ingress and egress routing. 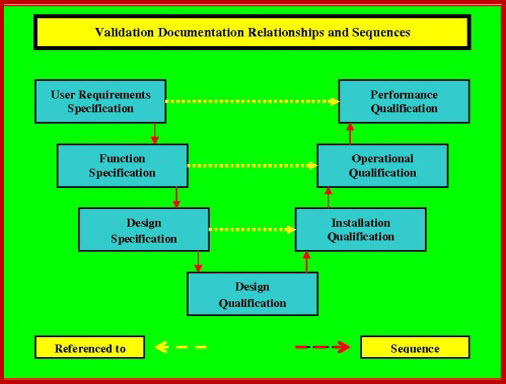 This is a high level document and only practices and procedure should be discussed but not detailed This document interfaces with our Validation Risk Assessment (VRA), Validation Project Plan (VP), User Requirements Specification (URS), giving a seamless flow from your VMP through the VP - IQ - OQ - PQ, while integrating flawlessly with the URS - DQ - VRA. This VP details and integrates all validation activities and procedures required for small to medium sized projects. It must document activities and specify staff responsibilities. It must set boundaries and define limitations. It must define test methodologies and project times lines. It may be specific to one item or might cover several (similar or identical) items. It sets company and policy on all matters pertaining to the validation task. Each end user requirement must be listed in such a concise manner that with the execution of a purpose designed test script a qualified observer could ascertain as to whether the documented acceptance criteria; for that requirement, has, or has not, been satisfied. This document was designed to be used as a live document up until the DQ is completed and approved. It uses three levels of URS, URS Level 1, 2 and 3, and is the only URS to guarantee traceability from the URS through to the final PQ and OQ functionality testing. This is a mandatory requirement for Full Life Cycle Validation (FLCV) of computer systems that are the subject of predicate rules. It can be used on mechanical, electrical and software controlled, monitored or managed systems.